This film should be required viewing for anyone who works in the justice system. This story is a textbook example of how wrongful convictions occur. There are common elements with every wrongful conviction. They most often involve males between the ages of fifteen to twenty-five. They most often involve people who are ignorant of the legal system and trusting of the police. It starts with an interrogation — an interrogation that is not recorded or videotaped — an interrogation without a lawyer or parent present. The interrogations go on for hours. They intimidate the person being interrogated. They threaten the person being interrogated. They lie to the person being interrogated. In this case the detectives tell each suspect that others are implicating them in the crime. They make promises that if they only cooperate that they can go home. After hours of intimidation, threats, and lies by the police they agree to give a confession. The thinking is that if they give them what they want they can go home. So the detectives start writing the confession for them. This goes on with the detectives giving out the necessary details that will eventually convince a jury. “The suspect knew details that only a person involved with the crime could have known,” the prosecutor tells the jury. She doesn’t mention the fact that those details were provided by the detectives. When there is a lack of physical evidence, the prosecutor and detectives try to explain it away. When evidence does surface that would be favorable to the defense, they suppress it, destroy it, attempt to have it thrown out. In this case there was no physical evidence putting any of the five suspects at the crime scene. DNA evidence pointed to another individual. The crime scene itself didn’t fit the scenario the prosecution was promoting. Then the media gets involved. They report allegations as fact. They jump to conclusions. They convict the person with their parroting of the facts from the police. Antron McCray, Kevin Richardson, Raymond Santana, Korey Wise, and Yusef Salaam didn’t stand a chance. They were brought into court, their coerced confessions were played for the jury, and they were convicted and sent to prison. No one bothered to take a closer look at the confessions. No one bothered to point out that the descriptions of the crimes didn’t match, key details were missing or wrong, or that the timing of the crimes didn’t fit. One lone jury member who did notice these glaring discrepancies decided to stop trying to argue his point. He just wanted to go home. Forget the fact that he helped put five innocent men to prison. Once the truth is finally revealed, the people who made the mistakes, the people who used their positions and knowledge to put innocent people behind bars, destroying their lives and the lives of their families, they continue to stand by their actions. They can’t accept responsibility. So you would think that now that the truth has been revealed, these five men would be entitled to compensation. They filed a $250 million dollar lawsuit against the city. They did this in 1993. That’s right. The city has been fighting the lawsuit, delaying, trying their best to not pony up for their mistakes. The saddest part about this story is that this is not an isolated case. It happens more often than you would think. Do a search on this blog for “wrongful convictions” and you’ll read about more cases just like this one. Right now two young men sit in a Missouri penitentiary thanks to a coerced confession. You can read about that case in the post Mystery on Halloween night. I urge you to watch this film. I saw it on Amazon Instant video. But you can watch it on PBS April 16, 2013 at 9:00 pm eastern time. 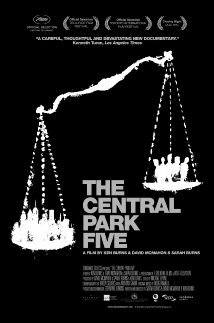 To learn more, please visit The Central Park Five on PBS.